The little-known but potentially important Intel Windows Display (WiDi) wireless technology has turned up in the latest Toshiba laptop, the Satellite A660. The new Satellite range feature the mobile versions of Intel's latest Core i3, i5 and i7 chips, nVidia graphics, and Blu-Ray drives you'd expect in a 2010 generation laptop, tied to a 16inch 16:9 ratio TruBrite LED screen and 802.11n Wi-Fi. One of the models will apparently extend this with WiDi (pronounced as in WiFi), a technology for beaming laptop screens direct to suitably-equipped TVs to allow them to be used an informal monitors. To work, the TV also needs a WiDi adaptor such as Netgear's PTV1000 to accept and translate the signals, so this could remain a marginal technology for some time. The main application is to display video, which is already possible on DNLA-equipped TVs, but WiDi should optimise that and allow the screen to extend the desktop. The other requirements mark this out as a slow burner. Laptops must be running at least an Intel Core i3-330M or better, and be running any of the Windows 7 64-bit versions. Toshiba's A660 will be available from June. Prices have yet to be confirmed. 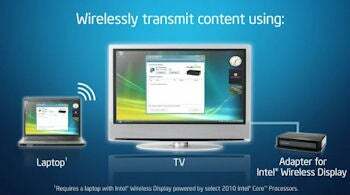 This story, "Toshiba Laptop Debuts Intel's Wireless Display Tech" was originally published by Techworld.com.